They say, no matter how much you eat, there’s always room for dessert. Dessert doesn’t go to the stomach. It goes to the heart. And we couldn’t agree more. If the main course is the cake, the dessert is the cherry on the cake. No one can seem to get enough of sweets. Having a dessert after a meal is almost considered as an important tradition across cultures of the world. The meal just doesn’t seem complete without a dessert. Desserts have a certain ‘feel good’ factor associated with them. The sweet taste of the dessert almost acts like an anti-depressant. 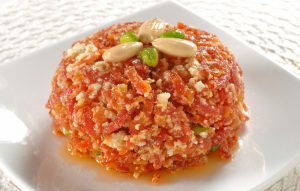 A thick, sweet paste prepared using grated carrots, condensed milk and nuts, Gaajar ka Halwa is a winter specialty. Savored by adults and children alike, this sweet dish is prepared in almost every north Indian household during the winter season. Carrots are known to be an abundant source of Vitamin A. 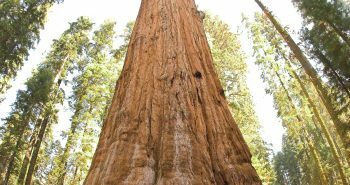 They are also known to be effective in detoxifying the liver. A sweet dish with its own health benefits, what more can one ask for! 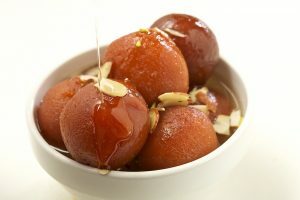 A spongy, sweet, brown colored ball, dipped in thick sugar syrup – that is Gulaab Jamun for you. Filled with the fragrance of cardamom and roses, your mouth will water at the mere sight of a Gulaab Jamun and no, we’re not exaggerating. Gulaab Jamun is sheer happiness on your tongue, khoya or evaporated milk being the main ingredient of the recipe. The term Gulaab Jamun was derived from the fact that the sugar syrup is rose flavored and the balls are the size of Jamun berries. 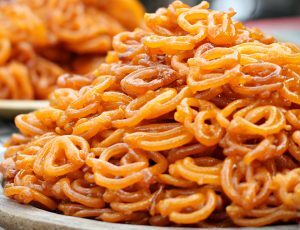 When maida flour batter is deep fried in circular shapes and then soaked in thick sugar syrup, the result is sheer awesomeness or as we would call it, Jalebis. Jalebis need no introduction. It tastes best when paired with rabri. It is crispy and usually consumed hot. It is considered to be the typical ‘celebration sweet’ in India. Jalebi is one effective solution for everyone who’s got a sweet tooth! Made from round dumplings of Indian cottage cheese or ‘chhena’ and semolina paste, Rasgullas are popular throughout the country. West Bengal is primarily known to be the birthplace of the dish. The chhena balls are boiled and then dipped into sugar syrup or ‘chaashni’ until it permeates the sweet ball completely. 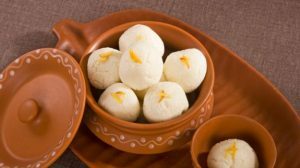 Rasgullas can be served hot or cold and they would taste equally delicious. The name of this sweet preparation is derived from two Hindi words, ‘ras’ meaning juice and ‘malai’ meaning cream. 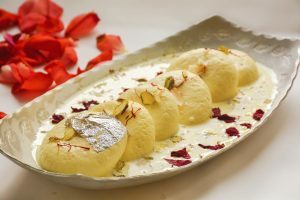 Flattened chhena balls are soaked in malai and flavored with cardamom and saffron. This dish tastes best when served chilled. The chhena ball is gooey in texture and melts in the mouth leaving one gasping for more. The origins of this dish are traced to be in West Bengal though it is consumed with equal enthusiasm throughout the country. Shahi means ‘royal’ and ‘tukra’ means piece. A sweet dish made using bread is surely going to be a royal piece in your mouth. A rabri is prepared using milk, sweet condensed milk, and the flavors of saffron and cardamom. Bread loaves are then cut into half and heated on a tava. The mixture of rabri is poured over the bread slices. The recipe is served hot for a rich, royal and heavenly taste. 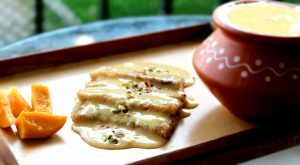 A sweet pancake, malpua is popular in North Indian states. It is also presented as an offering to Lord Jagannath in Puri. A dish that is offered to the Gods must be a divine delight for humans. A batter using flour and rice flour is prepared and pancakes are made out of it. The batter is then fried in hot ghee and dipped in sugar syrup. To enhance its taste, it is often served with rabri. 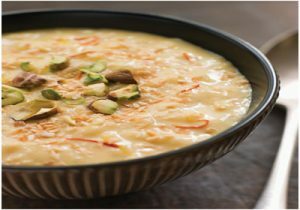 A rice pudding prepared by boiling rice, milk and sugar and often flavored with saffron, cardamom, almonds and pistachios. It is also known as Phirni in some regions and the South Indian version of kheer is known as Payyasam. It is usually prepared in Indian households on festivals and special occasions. Whether served hot or cold, it tastes equally delectable. 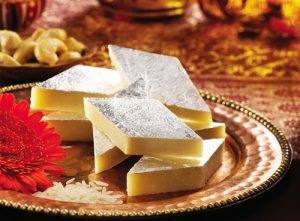 Barfi made with cashew nuts and milk and decorated with silver warq, kaju katli is a childhood favorite. On special occasions, it is usually exchanged as sweet gifts. Traditionally eaten during Diwali, this sweet dish is enjoyed and loved by people throughout the year. 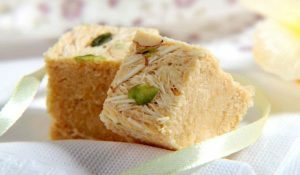 Kaju katli is undoubtedly one of the most sought after Indian dessert. 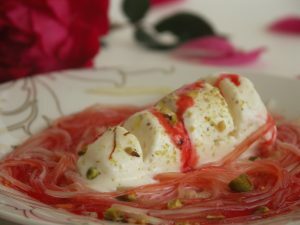 A summer favourite, Kulfi Faluda is a frozen dessert topped with Faluda sev along with rose syrup and dry fruits. Kulfi is the Indian version of ice cream. Perfect remedy to a hot summer day, this dessert is refreshing, cooling, velvety, sweet and crunchy, all in one. The first gulp of it down your throat gives you a sense of happiness that is inexplicable in words. You have to try it to know it. 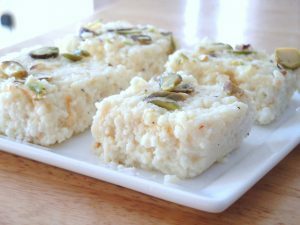 A dry north Indian dessert, Soan Papdi is usually served as cubes of flakes and has a crisp and a flaky texture. Contrary to its appearance, it dissolves in your mouth almost immediately. 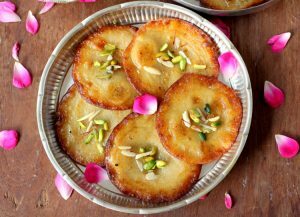 The prime ingredients of this dessert are besan, flour, ghee and sugar and it is usually flavored with cardamom and rose syrup and garnished with dry fruits. With its origins in Alwar, Rajasthan this dish is prepared with sweetened, solidified milk and paneer. The milk is boiled on a large flame and is continuously stirred till it thickens. Then, it is flavored with nuts and dry fruits. An essential part of festivities in India, Kalakand has a crumbled texture. Ball shaped sweets that are made of flour and sugar laddus are a popular Indian dessert. The flavor of the dessert might vary according to one’s taste and region, but this is one dessert that is loved by children and adults alike. 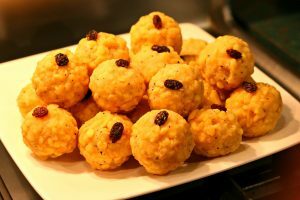 Laddus come in a variety of flavors like coconut, besan, boondi, malai and gond (edible gum) and are the preferred sweets for religious occasions. 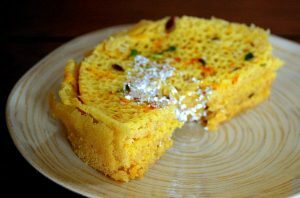 A Rajasthani dessert, Ghevar is traditionally associated with the teej festival. It is a disc shaped dessert made using all purpose flour and sugar syrup. It is savored with great delight in Northern part of the country and comes in a variety of flavors such as malai and mava Ghevar. It has its own unique flavor and melt-in-the-mouth texture. 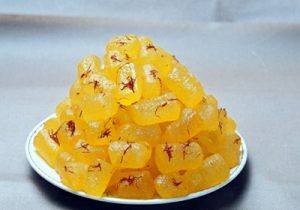 A soft translucent candy, Petha originated in the city of Agra, from the kitchens of Mughal Emperor, Shah Jahan. It is prepared from a fruit called ‘winter melon’ which is consumed as a fruit and as a vegetable when it matures. It is usually cylindrical, rectangular or round in shape and tastes best when refrigerated. It usually comes in a variety of colors and flavors such as Angoori Petha, Coconut Petha etc. It has a smooth texture and a slight crunch.